Included in the group were Emma Powell, National Account Manager for Bunzl Catering Supplies and Hiramoni Sarma, Direct Marketing Manager for Lockhart Catering Equipment. Their journey started in Hanoi where they trekked through the Vietnamese jungle for 5 days, before spending three days in the Hao Binh province helping to build school classrooms. Springboard is a charity that helps young people achieve their potential and nurtures unemployed people of any age into work. It helps alleviate poverty by supporting disadvantaged and underprivileged people into sustainable employment within hospitality, leisure and tourism. 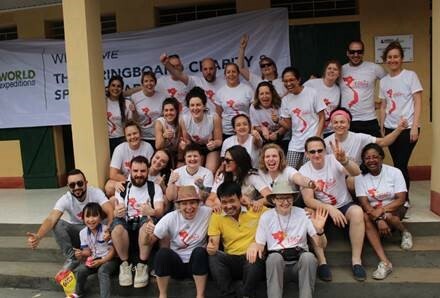 Springboard aimed to raise a total of £135,000 from participants of the trek, to help the communities in Vietnam and continue their great work for the UK catering and hospitality industry. 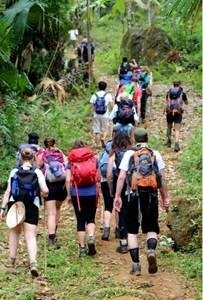 Why did you volunteer to take part in this trek? I wanted an adventure – and to visit a country I had never been to before! But importantly, whilst having this adventure, I wanted to give something back, to make a positive difference to the local community. What part of the trek did you most look forward to? 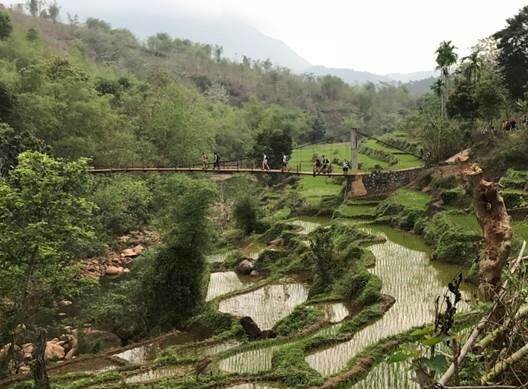 I was most looking forward to the walking and to experiencing the diverse landscapes of rural Vietnam. We walked through jungles, bamboo forests, paddy terraces, remote villages, larger towns – it was a real eye opener. What fundraising activities did you organise to raise money? I organised a fun day at our national distribution centre in Tamworth, where we had a tombola, a Bunzl ‘Bake Off’ competition and a cake sale. Our suppliers helped organise a raffle for my colleagues, friends and family, providing some fabulous prizes including: a monster truck experience, Google Home and a 6-person dinner set. I also received some fantastic support from a raffle kindly held at the Bunzl Catering & Hospitality divisional conference in January. I am already a keen walker and have completed long-distance walks for charity in the past, in the lead up to this trek I did do the recommended 30 minutes of cardio three times a week to build up my stamina. What did you think was the most challenging part of the trek? The speed of the experience, we did so much in the 10 days that we were in Vietnam that it was hard to keep up. 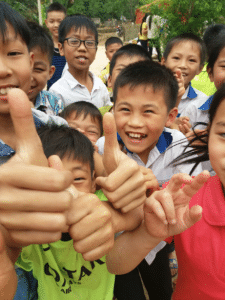 We arrived in Hanoi after a 12-hour flight, got straight into a guided tour, then trekked 90km in 4 days and finished at a local school where we worked long days on building work. Luckily, I did this with an amazing group of people who helped keep morale high. What was your favourite moment from the trek? The appreciation that the teachers, school children and community showed us for our help. On the final day, they thanked us in a special ceremony where teachers and government officials made speeches, the children performed dances and everyone got involved in some sporting activities – we all enjoyed it. What did you see that had an effect on you? 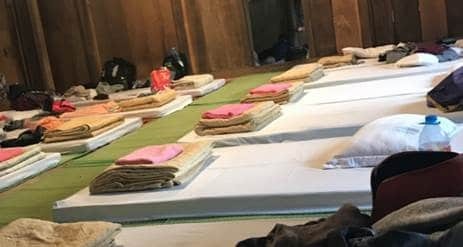 Seeing the results of working as a team at the local school, seeing the before and after pictures, it gave me a tremendous sense of achievement, and really brought home the importance and effectiveness of working together. In Vietnam we stayed in homestays, traditional houses with a kitchen and bathroom outside and everything else in a single room. It was so simple, but we had everything we needed, and the people were happy to share everything they had with us. I realised what a materialistic life we lead in the UK, so much clutter around us all the time, perhaps it’s not really needed. Would you do the trek again – or recommend someone else to do it? 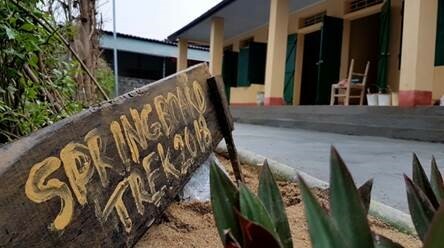 I would love to do the trek again and I would recommend it to anyone. Of course, it was a challenge to raise the money and complete the trek, but it was also such an awe-inspiring whilst humbling experience – I will never forget it. Is there anyone you would like to thank for helping you achieve your fundraising goal? I would like to thank all my Bunzl colleagues, friends and family who made a donation and supported me. In particular, I would like to thank Jess Smith, National Account Co-ordinator for Bunzl Catering Supplies, and our suppliers, who all helped to organise many of my fundraising events.